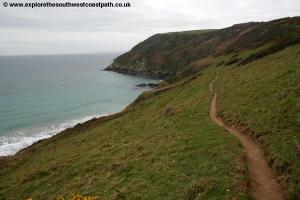 This walk is one of the most beautiful on the whole coast path, taking in some stunning scenery but it is also one of the toughest section, especially between Polruan and Polperro. However the rewards are worth the effort with some stunning views and near deserted sandy beaches. 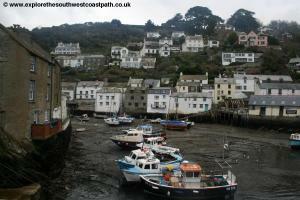 Polperro is also a real treat and not to be missed. 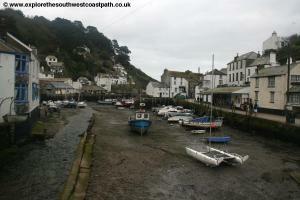 If the walk is too long it can easily be split at Polperro. Due to the very limited nature of the public transport between Polruan and Looe you may instead prefer to park in Looe and then take the bus to Polruan in the morning and walk back to your car. There is a large car park just north of Looe bridge in West Looe and from here you can take the bus to Polruan but check the timetable, as it does not run frequently and only runs on weekdays. 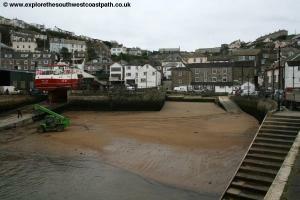 If you are travelling by public transport there are two options to reach Polruan. 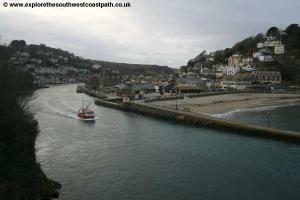 The first is the direct bus service from Looe. This runs 4-5 times daily (at the time of writing) on weekdays only. This is bus number 481, operated by Travel Cornwall which runs via Polperro. Note that due to the very narrow roads west of Polperro, this bus is run by a 16-seat vehicle and as such has limited capacity so please call if you are planning to walk in a group. This bus starts from Looe which has a broadly hourly train service from the main line at Liskeard along the scenic and quirky Looe valley line. There are also fairly frequent buses between Looe and Liskeard. 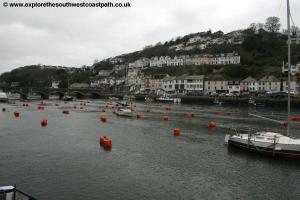 An alternative is to travel to Fowey and take the ferry across the estuary. Fowey has a frequent bus service from Par and St Austell (both of which have railway stations) and from there the passenger ferrry runs typically every 15 minutes to Polruan. The most frequent public transport in Polruan is the Polruan Ferry servive from Fowey on the opposite bank of the river. This generally runs every 15 minutes. Fowey has a fairly frequent bus service from Par and St Austell, both of which have railway stations. Polruan is quite a small place and as such has quite a limited range of accommodation. Hormond House B&B is a bed and breakfast in Polruan. 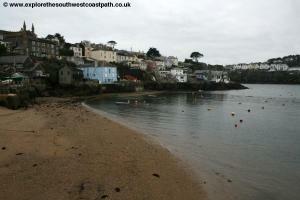 The Fowey Hotel is a hotel just across the river in Fowey, easily reached via the ferry from Polruan. 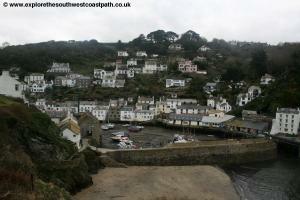 Polruan Holidays is a campsite and caravan site on the edge of Polruan. As an alternative to staying Polruan there is a larger range of accommodation in Fowey, easily reached by ferry from Fowey and in Polperro (which is on the walk) and Looe at the other end. 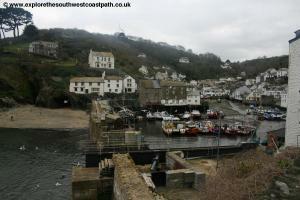 The walk begins from the quay in Polruan. From the quay head up the hill inland and soon fork right along West Street. Just before this road ends you turn left along Battery Lane. Soon you reach a Coastguard station and fork left with the road. 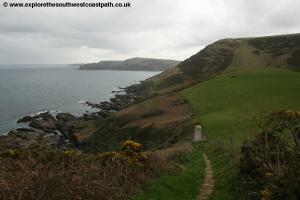 As the road turns left ahead you keep straight on along the signed coast path entering a grassy area. The official route of the path here is to keep on the high path, but there is a lower path leading out to the old battery. Although not a lot of the battery remains this is worth taking, as the views back over the water to Fowey and around the coast are wonderful. Returning to the coast path you take the path back up aiming to the right of the last houses you can see and soon rounding the back of the car park where there are also the remains of an old stone wall and a coastwatch station. From here you take the part surfaced track through the signed overspill car park heading east and passing the coastwatch station on your left. This soon joins the minor road passing the village school on the left. Continue to the junction with School Lane and here you turn right on the signed coastal footpath that makes it's way over fields and back down to the coast. 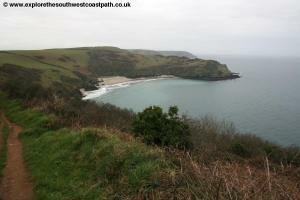 You now follow this good path along the south coast of the little peninsular. 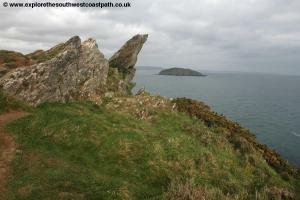 Ignore forks off to the left and continue on the main path ahead soon entering the National Trust land at Blackbottle Rock, where there is a fine view in both directions â€“ to the west back towards Polruan and Fowey and to the east to the spectacular coast of Lantic Bay ahead. 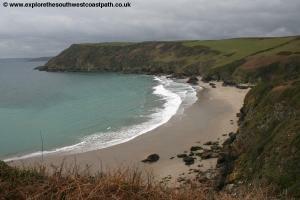 Take the good coastal path that soon comes to Lantic Bay. 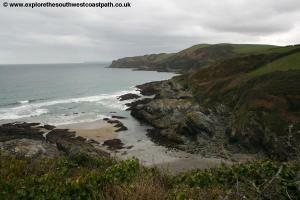 This is a really beautiful spot â€“ what coastal walking is all about! 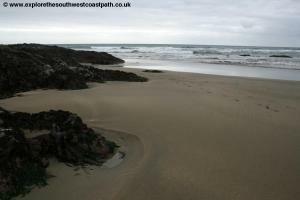 It is a lovely secluded south facing mostly sandy beach. With no car parks immediately close by (or even roads) it means it has been left totally unspoilt. You won't find cafes and shops here, and in my opinion it is much the better for it. The path gradually climbs as you head east along to Great Lantick Beach and oddly there is a path through a gate to the right, but the official route is signed ahead still climbing. In truth you have a choice of routes here, a slightly lower and more coastal path (which oddly, is not the official route) or a slightly higher path. 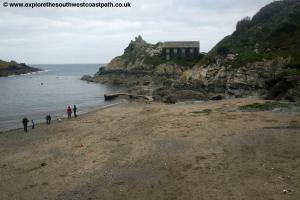 If you wish to get down onto the beach you need to take the lower path, otherwise take whichever you choose. Off the lower path the path splits with a track off giving access down to the beach. 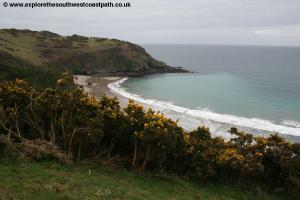 But remember there are a lot of steps and the path is quite steep in places, but the secluded and sheltered sandy bay is worth the climb down. Returning the coast path you take either of the paths that head round to the headland of Pencarrow Head, again National Trust land and offering fine views to the west in particular. 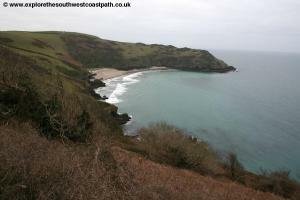 The coast path rounds the headland and soon turns to head north and then north east along the eastern side approaching another couple of beaches. The official higher path goes above a remote little cottage perched on the cliff top but there is also a lower path here that goes in front of the cottage (and is also a right of way) which can be taken instead if you prefer a slightly more coastal path, but it does mean losing and then re-gaining some height. The cove here is named Watch House Cove, and this little house is presumably the Watch House after which it is named. A little while further along you come to the lower cliffs around the back of Palace Cove. 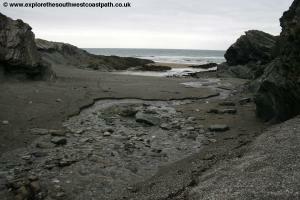 A narrow path goes down to this mostly rock beach if you wish to access it, and there is also some sand at low tide. 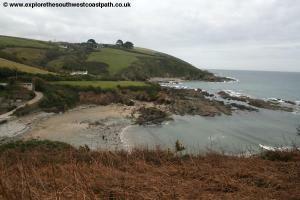 A little further round you come to the lovely and secluded beach at Lansallos. Here the stream that flows through the valley from the village of the same name tumbles over the rocks creating a little waterfall. 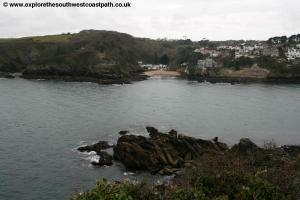 There is access to the beach here, which has many rock pools and little caves ad well as some sand. From here the coast path heads briefly inland, along the track leading down to the beach but then you turn right off it and back up and round to the coast. 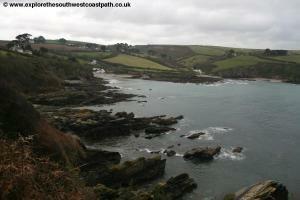 You round the little cove of Parsons Cove and then continue east on the main coast path. 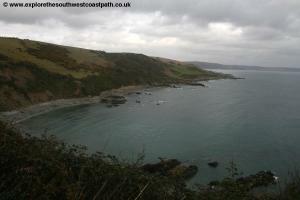 The rest of the coast path from here to Polperro is tough and will almost certainly take you longer than you expect. The coast is easy to follow but there are many steep valleys where you drop right down from the high cliffs to sea level, then climb immediately back up the other side. The first of these valleys is at East Coombe where you cross the stream via a wooden footbridge and then climb steeply back up the other side. Soon you pass behind Broad Cove a rock and shingle beach. 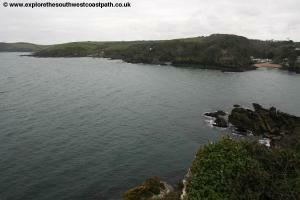 The coast path cuts a fairly straight line ahead rather than go out right around each of the little bays. Soon you descend down another little valley, Great Lizzen and back up the other side.. 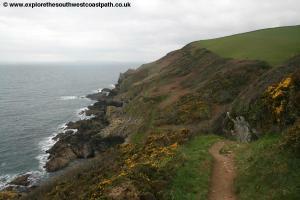 Soon the path turns with the coast a little to the right through the gorse covered cliffs. 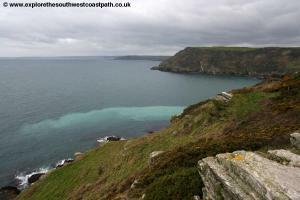 You soon have another descend down to sea level to pass another spring at Colors Cove but ahead the coastal path leaves the cliff top and takes a slightly lower path part way up the cliffs. 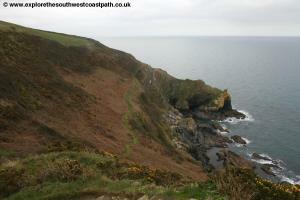 Soon you descend back down to sea level and back up and now follow the path that goes right along the cliff top. 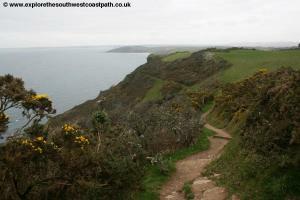 Ignore a path off to the left ahead and instead keep to the coast path right along the cliff top. 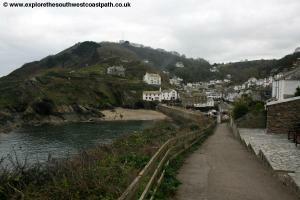 As you near Polperro the path slips into several paths at different heights above the coast but it doesn't matter which you take as they soon all end up in the same place. You don't see Polperro until you come to a couple of little cottages on the cliff top, but as you round the corner there you can see it. This is a wonderful place and it's amazing how many cottages have been crammed into this tiny valley. The roads are so narrow that you can reach out and touch buildings on both sides at the same time. For this reason tourists visiting the town are forced to park around half a mile north of the harbour. Polperro can get very crowded in the summer months but it really is amazing and should not be missed, with it's beautiful harbour and narrow streets. It really does seem that cottages have been crammed into the village at all angles and in every available space! 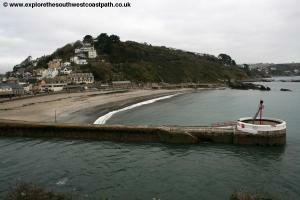 The coast path goes down a flight of stairs (the first you come to, to the right) to reach the west side of the harbour. You then follow the roads around the harbour and back round the other side, following Talland Street and then The Warren. Follow this the most coastal of the roads around the north side of the harbour, with views back over the town and to the other bank of the habour where we entered the village. Soon the road narrows and then it splits, with the track continuing ahead and a lower path to the right. The main path is ahead, although the lower path can also be used, as they soon merge. Keep on this main track ahead but when it splits it again this time take the lower (right-most) fork. Follow this round to Downend Point, after which there is a war memorial. Continue on the main path soon passing a few houses on the left and then descending down into the village of Talland and Talland Bay. 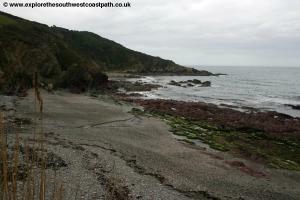 This is a peaceful and secluded beach which is a mixture of sand and shingle backed by a few cottages. Follow the road along the back of the beach passing a cafe on the left. Continue up the hill to reach the public toilets and at the t-junction ahead, turn right. Follow this road the short distance to the next little beach, oddly called Rotterdam Beach. As you reach the couple of buildings at the back of the beach turn right with the coast path sign into the little car park and then take the coast path up steps from the car park. 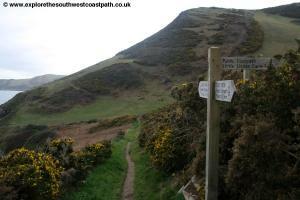 In comparison with the coast you have already walked the coast path ahead is now relatively easy, with an easy to follow path along the cliff tops with only fairly gentle undulations. 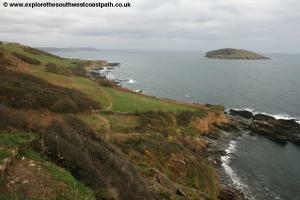 Follow the wide track out of Talland Bay and continue as it narrows to a footpath. 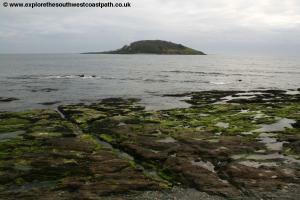 After a little over half a mile you reach the tip of the headland and round this to face Portnadler Bay ahead. 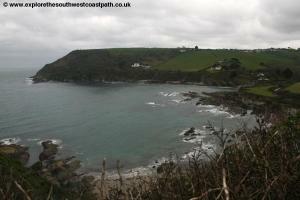 The coast path rounds the back of this shingle and rocky beach and you soon have views of Looe island ahead. This was a privately owned island, but in 2004 it was passed to the Cornwall Wildlife Trust and there are now boat trips from Looe to visit the island. 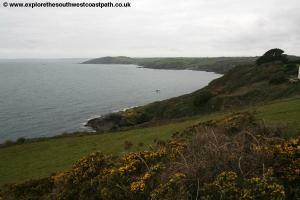 Ahead you have the major descent and ascent of a valley, this time from Portlooe. Round this and you continue along the good path until rather ubruptly it comes out at the end of a cul-de-sac coastal road. 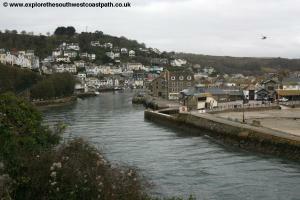 This is the village of Hannafore which leads into Looe. Follow the pavement alongside the road Hannafore Point. Continue round on the road with a pleasant grassy area to the right. Ignore any paths down to the right. 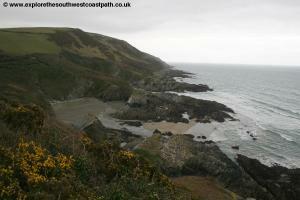 For part of the way there is a tarmac path along the back of the cliffs at beach level, but this is a dead-end. The pavement soon ends by a couple of large hotels on the left and you must now follow the increasingly narrow road. Soon the road rounds the corner offering lovely views over our destination, Looe, to the right. Soon the road descends and you follow it as it twists and turns down to reach the side of the Looe river which splits east and west Looe. Soon you can see the bridge ahead of you and you follow this road all the way to reach the bridge. 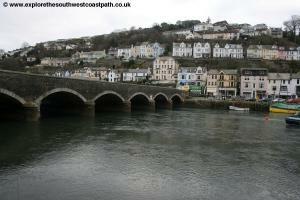 Turn right to cross the bridge (which has a pavement) to enter east Looe, which has more facilities than West Looe. Here you can turn right for the main town centre or left for the railway station and bus stops. The simplest way to get back is to take Travel Cornwall bus service 481. 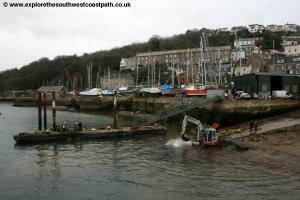 This runs 4-5 times a day on weekdays only direct back to Polruan. Note that due to the narrow roads the buses are small and have a limited capacity so make sure you contact the operator if walking in a group. If you have made a shorter walk from Looe to Polperro, Western Greyhound service 573 runs up to every 30 minutes Monday – Saturday between East Looe and Polperro and once every two hours on Sundays although many of the buses (and all of them on Sundays) depart from the Crumplehorn car park around half a mile out of the town. If the direct bus is not an option (at weekends for example) it is a rather long-winded journey to get back to Polruan. Take Western Greyhound service 573 to Liskeard railway station. This bus runs hourly Monday – Saturday and once every two hours on Sundays. From Liskeard take the train to Par. Trains on this route are operated by Great Western Railway and Cross Country Trains and there is roughly an hourly service, but times vary. The train journey takes around 10 minutes. From Par Western Greyhound services 524 and 525 depart for Fowey roughly twice an hour Monday – Saturday and hourly on Sundays. Finally at Fowey you take the ferry back to Polruan. 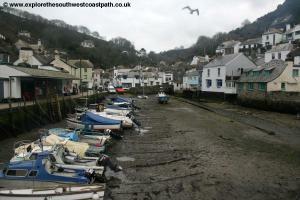 Ordnance Survey Explorer map 107 covers the coast between Polruan and Looe and is available from bookshops nationwide. 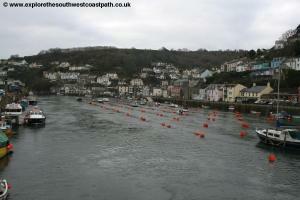 The links below show the map of the coast from Polruan to Looe.